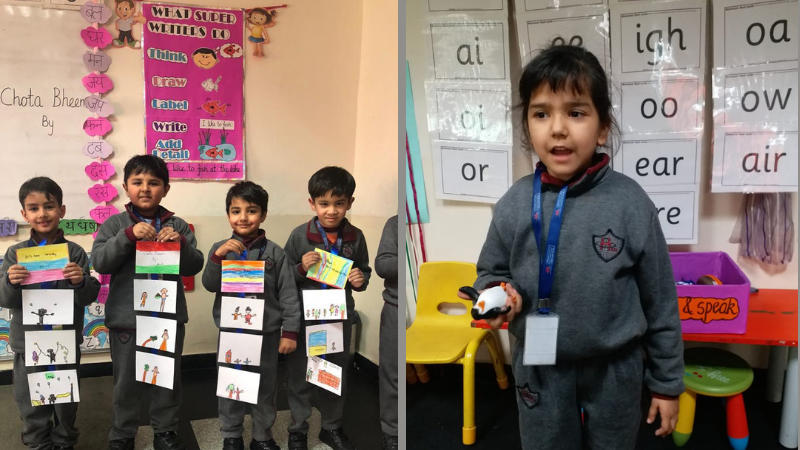 MRIS-Sector 14, Faridabad organized Literary Week for Kindergarteners with an array of activities to encourage students to develop an understanding and love for the language. The aim of the ‘LITERARY WEEK’ was to hone the LSRW skills (Listening, Speaking, Reading and Writing) of the children in an unconventional method. The week commenced with’Travel with a story’ day wherein the children enjoyed listening to some special stories like The Snow White and The Seven Dwarfs, Best Friends, Smart Honey Bee, Three little pigs etc. Children spoke impromptu in PICK AND SPEAK- EXTEMPORE activity, about incidents and experiences from their daily activities. Reading, a very important aspect of language was covered through the D.E.A.R – Drop Everything And Read activity. Along with independent reading, they also had guided reading. Weave-a-story activity gave them an opportunity to expand their wings of imagination and create a story, working in groups. In the STORY CALENDAR activity, the kindergarteners donned the robes of young authors and illustrators, creating their own story calendars based on the story they weaved within their assigned groups.The week ended after an engaging mix of learning with fun and a whole lot of enriching experiences.